Week five was a great week of training for me. I knew I would be going out of town to visit Nicole in California, so a high mileage week might be difficult. I decided to add in extra miles at the front of my week just in case I couldn’t run in CA. Monday – 3 miles at 8:45 pace. Very hard run…probably due to dehydration. Tuesday – 10 miles, 2 warm up, 5 x 1600 repeats: 7:21, 6:41, 6:38, 6:33, 6:37, 3 miles cool down. Good run overall. Ran the repeats in the neighborhood to give me some up and downhill practice. Wednesday – 4 miles at 8:45 pace. Following the run, went to TRX class. Friday – Tried out Nicole’s “Cross Pit” class in California. Loved it! Saturday – 16 miles at 8:48 pace. Awesome Saturday long run in California with the most amazing scenery along the way! Sunday – 3.5 mile hike. This was crazy hard at parts. I don’t know how trail runners do it!! I took this photo on my 16 miler in Cali. Pismo Beach is so pretty! Better late than never!! What a pretty picture of Pismo – I am glad you had fun on your visit. I loved having you here! 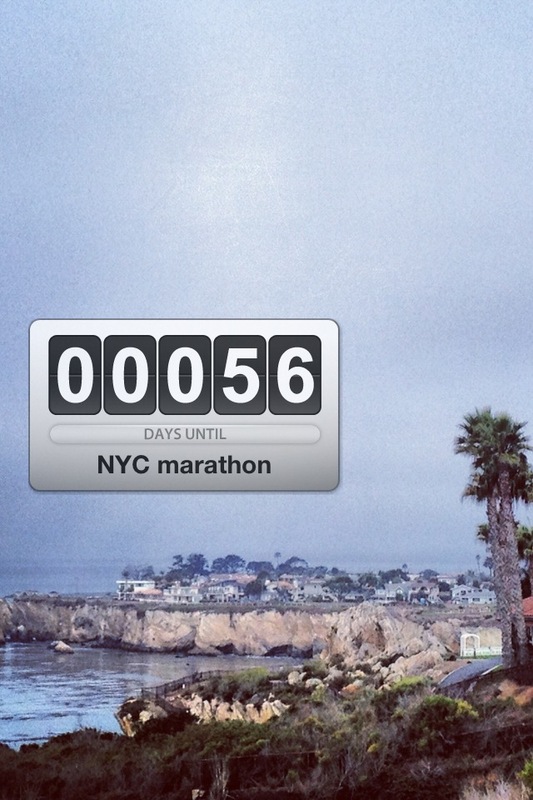 I can’t believe how soon your marathon is, time is flying by! Way to get it done! Marathon training is tough, you’re doing great! SUPER impressive mile repeat splits. Especially for doing them on the road with elevation changes! Your training has ramped up super strong! Can’t wait to see how NYC turns out for you. P.S. I am going to cheer/spectate/socialize and would love to meet you while we are there! !